You can now set the role of each team member. Admins can do all the dangerous stuff, like remove team members and boards, while regular members have access to everything they need to create new boards and work with tasks on a daily basis. You can now move tasks between boards. Sometimes you need to split a big backlog, or start from a clean state but want to migrate old tickets, and now it's a little bit easier. You can now add custom markers on the backlog to help plan upcoming milestones for your product. You can drag & drop these markers the same way as tasks, so refining your backlog should be very fluid. As always, they're fully supported on mobile as well. This is an often-requested feature that we know a lot of you will love, and we can't wait to hear your feedback on this beta feature. Epics beta is now live! In this first iteration, you can assign tasks into epics and see the epic of each task on the backlog. Epics can be easily selected and created in the same manner as other task details. 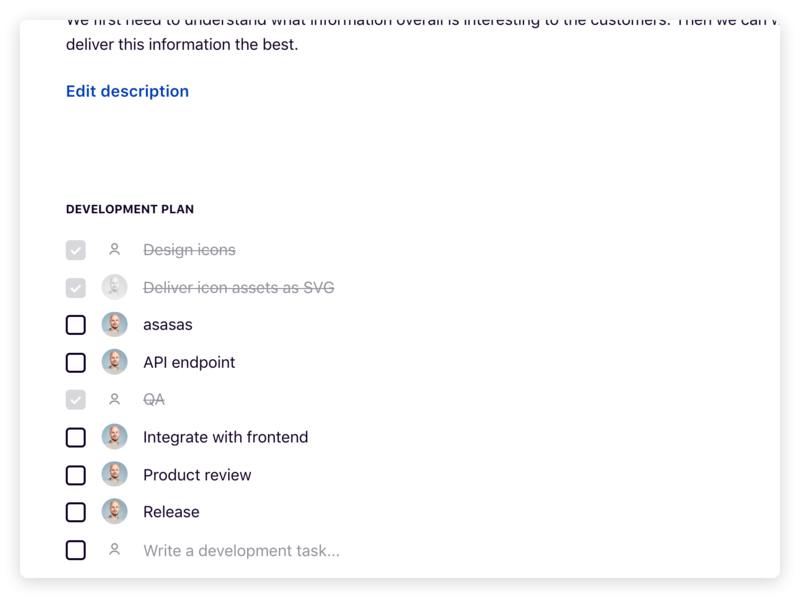 We will now start building on top of this basic functionality to deliver a full-featured roadmapping experience, and provide better visibility to progress in large boards where you might need a little bit more abstraction to stay organised. Remember to send us your feedback, and stay tuned for updates! You can now add way more detail into the status of each backlog item with subtasks! Subtasks are a way for your team to document how they plan to solve the problem that's defined in the backlog item. We show them as a checklist under the subtitle development plan. It's very fluid to add new development plan items, and you can also reorder and edit them easily. Each item can be assigned (use long press to quick assign yourself, if you want), so you always know who are the people involved in developing a feature. When you're done with a development plan item, you can mark it done by checking the checkbox next to it. We show the number of checked and remaining development plan items elsewhere in the system. Comment feeds for backlog items are now available! Comments are visible both on the task sidebar and the task page. There's also a small icon on each backlog item element that has comments to help you discover them better. You can now see a great overview of all your team's boards as well as each team member's active tasks on one page. You can also customize the look and feel of your tema page to make it stand out. Please send your feedback our way! We're excited to develop this team space into a simple but efficient dashboard for you and your mates. 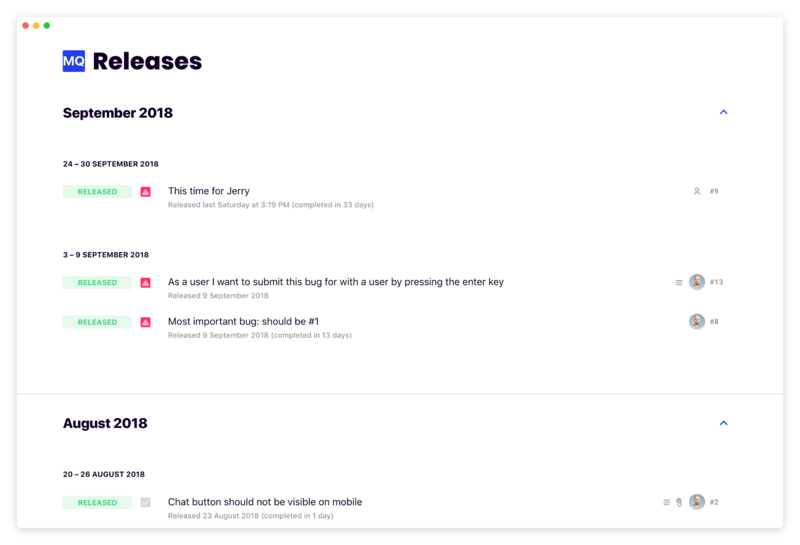 You can now see all your released tasks, stories and bugfixes in one place, grouped by month and week. 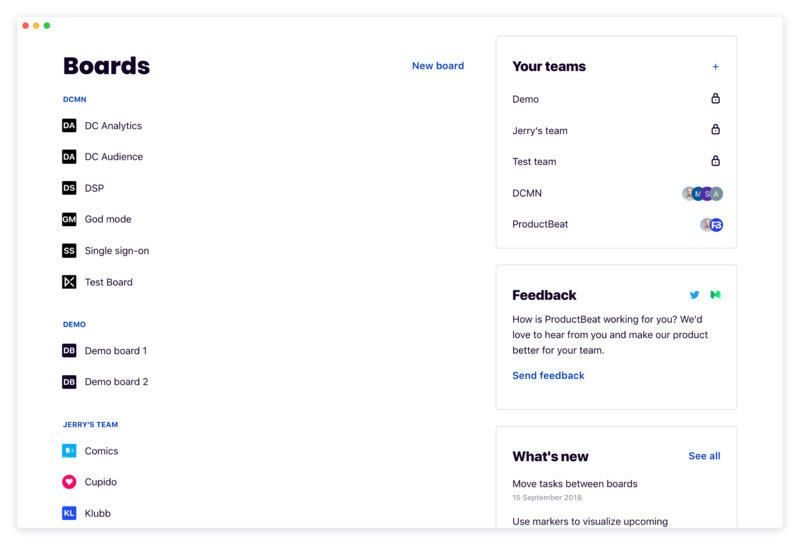 This gives you a great overview of your closed tasks and released features over time, and helps your team focus on what's important for your users: shipping things. You'll see a new link in the header on the desktop version, or bottom of the backlog on mobile. This view is generated automatically based on closed backlog items, meaning you don't have to manually assign tickets to versions or releases, or maintain any configuration related to them. We show you all closed items in a timeline that reflects your team's actual performance, and show relevant information (like calendar time from opening the ticket to release) right there in the release view. We hope seeing all your closed tickets in one place is helpful when discussing the definition of done with your team. And if you haven't talked about it, you definitely should! ProductBeat teams are here! 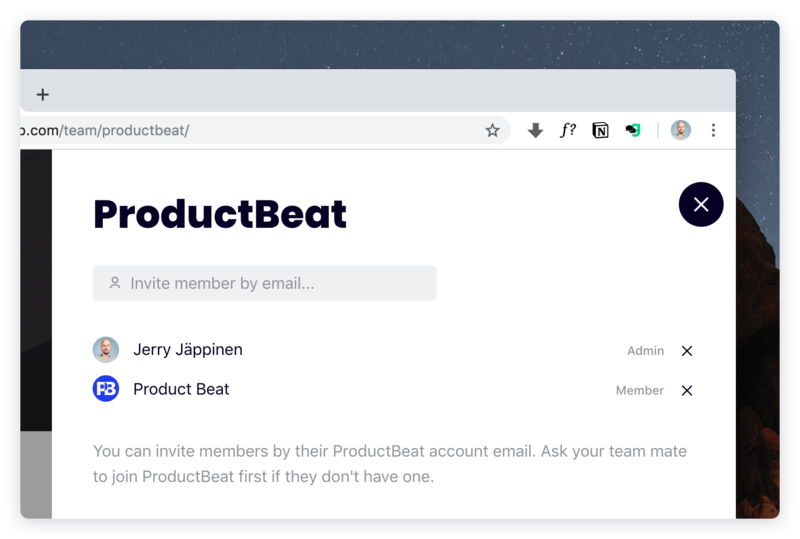 Invite as many people as you want to join your team, and all team boards are instantly available to them. You can even set a team color that spices up our UI and helps you keep track of all your boards. And of course, you can still use as many private boards as you wish. 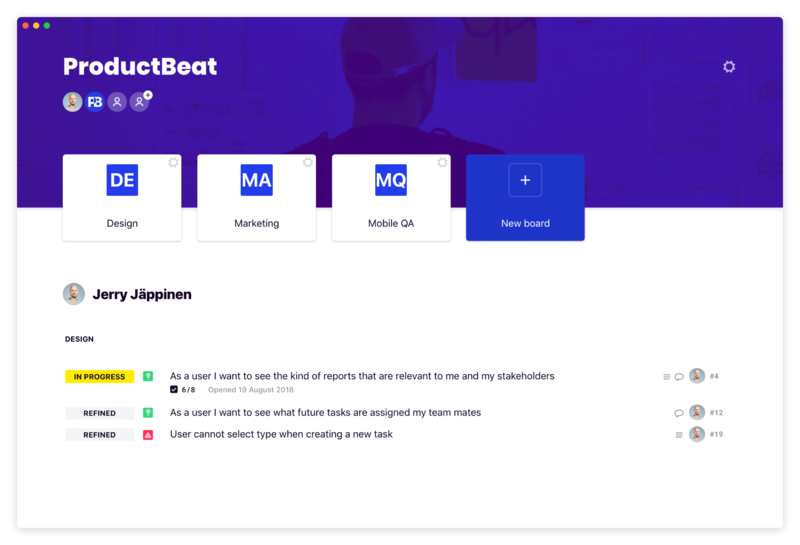 productbeat.com is now fully optimized for mobile so your team's status and your product's roadmap is always available for you. We will take great care in maintaining the mobile version just as we do the desktop experience from now on.